Synthetic phospho peptide (Human) - which represents a portion of human Rad 17around serine 645. HeLa whole cell lysate treated with 10 Gy IR. Antibodies that were not phospho-specific were removedby solid phase absorption. Antibodies specific for Rad 17pSer 645 were affinity purified using the phosphopeptideimmobilized on solid support. Our Abpromise guarantee covers the use of ab3620 in the following tested applications. WB 1/500 - 1/5000. Detects a band of approximately 85-88 kDa (predicted molecular weight: 77 kDa). Essential for sustained cell growth, maintenance of chromosomal stability, and ATR-dependent checkpoint activation upon DNA damage. Has a weak ATPase activity required for binding to chromatin. Participates in the recruitment of the RAD1-RAD9-HUS1 complex onto chromatin, and in CHEK1 activation. May also serve as a sensor of DNA replication progression, and may be involved in homologous recombination. Overexpressed in various cancer cell lines and in colon carcinoma (at protein level). Isoform 2 and isoform 3 are the most abundant isoforms in non irradiated cells (at protein level). Ubiquitous at low levels. Highly expressed in testis, where it is expressed within the germinal epithelium of the seminiferous tubuli. Weakly expressed in seminomas (testicular tumors). Belongs to the rad17/RAD24 family. Phosphorylated. Phosphorylation on Ser-646 and Ser-656 is cell cycle-regulated, enhanced by genotoxic stress, and required for activation of checkpoint signaling. Phosphorylation is mediated by ATR upon UV or replication arrest, whereas it may be mediated both by ATR and ATM upon ionizing radiation. Phosphorylation on both sites is required for interaction with RAD1 but dispensable for interaction with RFC3 or RFC4. Nucleus. Phosphorylated form redistributes to discrete nuclear foci upon DNA damage. Sample: Whole Cell Lysate (50µg/lane) from Hela cells treated with 10Gy IR or untreated. Publishing research using ab3620? Please let us know so that we can cite the reference in this datasheet. Is it possible for you to send me the ab63442? I am sorry this product did not perform as stated on the datasheet and for the inconvenience this has caused. As requested, I have issued a free of charge replacement with the order number 1048217 (ab63442). I repeated the experiment with a positive and a negative control ordered from another company, and the outcome was not improved. So I'm wondering if you have any other antibodies for the same target recommended? Please check ab115876 is a mouse polyclonal antibody, you would need anti mouse secondary if you opt for this. Let me know which ab you would like to try. I used human glioma cell line U251 in my study, and I have seen paper reported glioma cells have this pRad activity. I stripped and reblotted with Actin and got pretty good signal, which i guess means the transfer was good. I think what you said means using BSA for blocking can only reduce the background noise. Since I didn't even get any specific binding, I guess try again with BSA may not have signficant effect for my experiment. Well that's true. BSA reduces the background only, it does not have any effect on ab specificity. Anyway to proceed further in this case, I would like to ask if you are happy in trying a different lot or a different antibody. Alternatively I can also provide you full refund or credit note, which you can use for future purchases. Let me know the option you would like to go for. Many thanks for your cooperation in this case, I highly appreciate that. The samples that I used were whole cell lysates from cells 3 hours, 24 hours, and 48 hours post treated with 20 Gy of radiation, as well as cells without radiation as negative control. So I think the signal should be strong. By the way, what BSA solution do you suggest as blocking reagent? Do I need to use BSA solution for both primary and secondary antibodies? We use 5% BSA (Sigma) in TBST for blocking and for diluting secondary and primaries. Milk in not recommended for phospho specific antibodies because milk contains casein which is a phosphoprotein; This is why it causes high background because the phospho-specific antibody detects the casein present in the milk. Please be advised that BSA will only reduce the background i.e. membrane dirtiness, it will not effect the antibody specificity. So if the membrane shows high background then I would certainly recommend trying BSA. The other important point is, whether the cells naturally express the protein or not. I am sorry the info of cell line wasn't included in your email so I can't be sure about it. I would however recommend using Hela lysates as positive control. Are you sing human cell line? Actin or GAPDH can be used as loading control. Have you tried any of these? I hope these suggestions will help to improve your results. If the results do not improve please do not hesitate to contact me. Thank you for your enquiry regarding ab3620 and for taking the time to provide some useful details of the experiments. I am very sorry to hear that you are having problems with this antibody. ab3620 is a phospho specific antibody. We used 10Gy IR treated Hela cells to test the specificity of this antibody. I would recommend treating your sample cells there by inducing the phosphorylatuion of amino acid chemically or by radiations. Milk is not recommended as blocking reagent with phospho specific antibodies. Please use BSA. Please try both of these suggestions and let us know the results; we will be happy to help further. 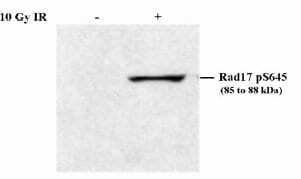 I ordered an anti-pRad17 antibody (Ab3620) recently and tested on my cell lysates for western blot. I started with cells with and without radiation and expected an enhanced pRad17 activity in cells with radiation. However, I didn't get any signal from my blot. I'm wondering if you can help me troubleshooting with my western blot experiment? Please could you provide some further details of the protocol used and complete the following form (attached as a word document). It would be much appreciated if you could attach an image to the response. I am interested in your human rad 17 antibodies and was concerned that your goat polyclonal recognises a 90 kD protein, whereas your rabbit polyclonal recognises a 69kD. The phospho specific ( and therefore I assume slower running) comes in at 85-88kD. Is there a reason that your polyclonal goat recognises larger protein? To our knowledge, these three antibodies have not been used in parallel, which would be required to determine if there are truely differences in the apparant molecular weight of the protein recognized by each antibody. The differences in the reported apparant molecular weights of the proteins detected by the 3 antibodies is likely owing to differences in molecular weight markers that where used, position of the sample relative to the positon of the molecular weight markers in the gel, and size and composition of the resolving gels. The difference in relative mobility of the protein recognized by the goat anti-Rad17 and the phospho specific antibody is certainly within experimental error.